Two days after it launched from Florida, SpaceX's Dragon cargo capsule has docked at the International Space Station. The spacecraft was carrying 5,800 pounds of supplies, including research material, crew supplies and launch and return hardware to the orbiting laboratory.It marked the successful completion of the 14th mission that SpaceX had been contracted to carry out for NASA.Launched on Monday evening from Cape Canaveral in Florida, the supplies in the Dragon will only now on Wednesday begin to be unloaded by the ISS crewIts cargo included an upgraded printer, components for an external high definition camera, and a controller for the Space Station's CO2 scrubber which allows the astronauts to breathe.Among the additional research arriving for the US National Laboratory is a metabolic tracking investigation to evaluate how pharmaceutical drugs function in microgravity.The investigation could help discover whether drugs function differently in microgravity environments, potentially informing the development of cheaper and more powerful medicines on Earth. Also delivered was the Multi-use Variable-g Platform (MVP) which is able to host 12 separate experiment modules with samples such as plants, cells, protein crystals and fruit flies. 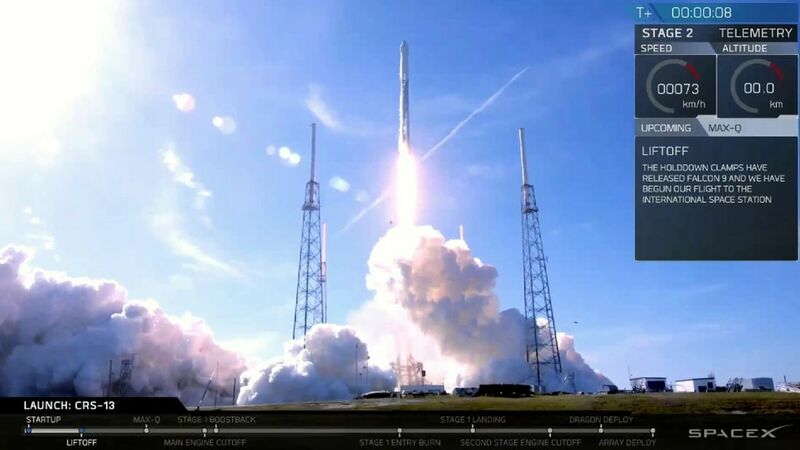 SpaceX has now flown more than 50 flights with its reusable Falcon 9 rockets since its first test launch in 2010.The rocket has received five incremental upgrades since its first launch, and SpaceX founder Elon Musk has declared that its final improvements would be made in April 2018.The rockets are capable of returning to Earth and landing upright on SpaceX's autonomous spaceport drone ships. What did Pope Francis say to astronauts? The Dragon capsule will remain attached to the space station until May, when it will return to Earth with more than 3,500 pounds of research, hardware and crew supplies.When it returns, it will be bringing back a broken plumbing system which processed the astronauts' urine, as well as the results of previous scientific experiments.